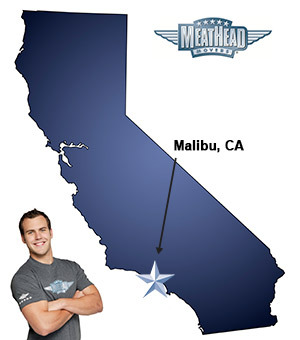 For a trouble-free move in California, Meathead Movers is the company for you! Our professionally trained student-athlete Malibu movers are ready to get you into your new home, wherever it may be. From the sunny weather and pristine beaches to fine shopping and dining, there are so many reasons to move to beautiful Malibu, California. If you’re moving for a new job or to enjoy the beach culture of the area, you’ll want to check out what our Malibu movers have to offer. The city of Malibu is so closely identified with its warm and inviting beaches that its name is taken from the Native American phrase “the surf sounds loudly.” Even though Malibu is known for its famous beaches—Surfrider, Zuma and Leo Carillo—and its wealth of celebrities: Jennifer Aniston, Halle Berry and Leo DiCaprio, just to namedrop a few, its appeal is more than skin deep. Malibu has an abundance of hiking trails, historical and cultural landmarks such as the Adamson House (former mansion of founders Frederick Hastings Rindge and Rhoda May Rindge), Malibu Lagoon Museum, historic Malibu Pier and the calming Serra Retreat, as well as other water activities besides the famous surfing: swimming, fishing, tide pooling, harbor tours, and whale watching. In addition to its scenic beauty, funky coastal charm, and gorgeous beaches, the city also boasts several eagerly-anticipated annual events including The Malibu Chili Cookoff, Malibu International Film Festival, Malibu Chamber Golf Tournament, Malibu Arts Festival, and the Malibu International Marathon. When you choose Meathead Movers to transport your treasured household belongings, you can rest easy. That’s because our strong, clean-cut student athletes—from colleges such as nearby Pepperdine University—are professionally trained and certified. And the Malibu movers who load your furniture will be the same movers who unload your furniture at your new destination. In addition to our superior moving services we also provide reliable packing, storage, on-site relocations, and our distinctive move concierge service. So whether you’re moving to Malibu from another city or to that beach house you’ve had your eye on for so long, you’ll find our Malibu movers ready to transport your precious possessions in a professional, prompt, safe and affordable manner. With our 100% satisfaction guarantee you have nothing to lose! So, what are you waiting for? Call our Malibu movers today for a free competitive quote and experience our revolutionary approach to the moving industry. Moving to Malibu? Here are some helpful resources. The workers are great! Very friendly and trustworthy! Efficiency and professionalism Great group of movers. The guys were amazing. They had to navigate a difficult and steep drive way. They went above and beyond to move an oversized couch that would not fit up the staircase. They walked it down the beach and walked it up a huge flight of stairs to store it in the garage. Doing all of this and maintaining a cheerful attitude. They were really awesome! Thank you, Michael Dodson Andrew Melendez Javier Aguilar Victor Nares Cuauhtemoc Zambrano You guys are the best! They showed up on time with all required materials. Two lovely young men. Clean with a smile on their face. We used them only as packers to put packed boxes into our garage. We had worked two full days to be organized for them. They thanked us for the organization and said we were an easy job. We contacted for four hours and they were done on time. Can only vouch for their packing not their moving. Luis and Alex were on time, hustled, were careful and super easy to work with! I would hire them again and Meathead Movers! I also recommend them highly! !